For CONDO New York 2018, Daniel Sinsel presents a group of new paintings that extend his long-term interests in space, volume, illusion and eroticism. Embracing a range of materials, he turns these themes into lenses through which to examine the medium of painting. Marked by trompe l’oeil illusion and technical precision, each of Sinsel’s paintings articulates the idea of the canvas as both an encompassing plane and material surface – as the formal parameter and physical essence of the work, probing its constraints and radically moving beyond traditional conceptions of its limits. In one painting, the frayed edges of the support serve simultaneously to frame the work and to extend it beyond the confines of the canvas, heightening the sense of movement and ‘free play’ found within the central composition. In this, handfuls of leaves fall, or float, against an abstract black background. The black expanse is interrupted by a geometric arrangement of tape-like strips – a coloured material that folds and winds into a complex shape, seemingly physical and yet flattened – as if pressed – against the picture plane. In the same work, circles, ellipses, and leaf motifs introduce competing planes and perspectives. Sinsel continues to deploy the meticulous illusionism that has defined his practice, and yet the concept of surface – both the physical base of the painting, and the undiluted, pigment-rich paint – is brought to the fore. Out of the language of abstraction, he conjures the sense of tactile – even anatomical – forms. Elsewhere, recognisable motifs sit alongside abstract formations, whereby Sinsel employs particular materials – including glass, cherry stones and nutshells – in ways that emphasise their innate qualities and symbolic associations. An unbound, gingham background becomes suggestive of the possibility of infinite continuation, and yet its quality of minimalist repetition and extension is interrupted by painted ellipses and embedded glass disks – suspended, free-falling portholes. Sinsel has embedded nuts and strips of fabric behind the canvas, to produce a less-immediate, more camouflaged intervention – a relief surface which alternately enhances and disrupts the larger chequered pattern. 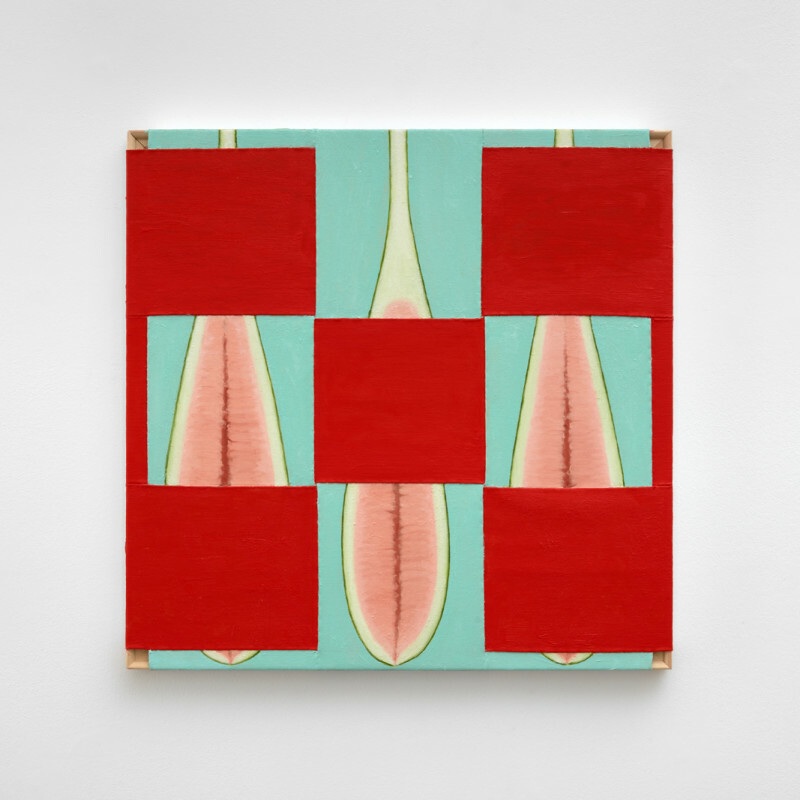 The red squares of the gingham background are echoed and inverted in Sinsel’s most recent painting (2018): three organic cross-sections of a plant-like bud or fruit, with undertones of human sexuality, appear side-by-side, overlain by a chequerboard of red squares. The grid pattern, alternating between monochrome squares and suggestive imagery, serves to rework and eroticize the ‘painterly’ dialectic of depth and surface. The interplay between surface and depth is moreover thrown into relief by the four corners of the work, at which the canvas is cut away to reveal the wood of the underlying stretcher. Sinsel’s interest in the ‘elective affinities’ between inanimate objects and corporeal forms, and in the concepts of surface and pattern, is evidenced in another (square) painting, in which the thickly woven linen of the work’s upper half is left exposed, its loose threadbare revealing the wooden structure of the frame behind. In the work’s lower half – its opaque and totalising background a warm, fleshy pink – the artist has used paint to extend the grid of the work’s gauze-like upper half into the lower section of the piece. Chewed mastic and a fading grey circle evoke a clogged or unrestricted flow or dispersion in the upper plane, tentatively crossing the point of the work’s divide. This dispersion of the upper plane is, in turn, connected to another fig-like fruit and its cross-section through a descending net, evoking diagrammatic tubules or bronchioles of a human organ.